Let’s face it, the main reason people are drawn to land in the NC mountains are the out-of-this-world views. Sunrises and sunsets just always seem to look better over mountain ranges. Why enjoy the mountains from afar when you can see fantastic mountain views from any window in your new home? If you are sick of the skyrocketing cost of living, the South Mountains of North Carolina is your escape. The cost of living in western NC is lower than the national average. This means you save money on housing, transportation, healthcare, groceries, entertainment, and more. What will you do with all that money? How about making that dream home a reality? Say goodbye to crushing snowstorms and long stretches of subzero temperatures. Sick of the oppressing hot and humid summers? 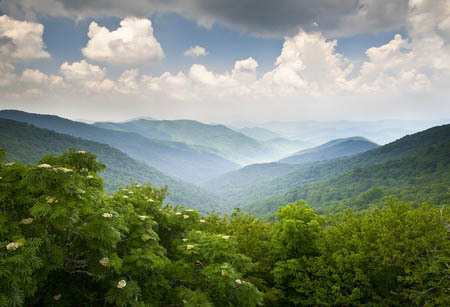 The mountains of North Carolina have you covered as well with a mild climate everyone can enjoy. Summers rarely get above 90 degrees and winters are never too cold. If you are concerned with maintaining your health, it is time to enjoy the benefits of mountain living. Higher altitudes have been shown to decrease the risk of certain heart diseases. People living at higher altitudes are also less likely to be obese. So let the North Carolina Mountains work its magic and inspire you to get moving and participate in some of the numerous outdoor activities available right outside your doorstep. When we say unlimited, we mean truly unlimited. Enjoy the 30+ acre Grandview Peaks community hiking trails, or hit the trails of the numerous National and State Parks surrounding the community. Whether you wish to stroll through dense forests, explore hidden waterfalls, or climb to the mountain summit, there are trails to suit all levels of hikers. The mountains of North Carolina is a fabulous location to cast your line and reel in a big catch. One of the community amenities is a stocked recreational 10 acre lake. Looking for more of a challenge? Enjoy fishing in nearby Lake Saint James or try your hand at fly fishing in one of the numerous rivers and streams in Western NC. Trade in traffic jams and stop lights every few hundred feet for an easy morning commute with jaw-dropping views. If you are expecting dirt roads, think again. Our paved two-lane mountain roads are well-maintained with wide shoulders perfect for cycling. Escape the pollution and smog of city living that can often exacerbate health issues like allergies and asthma. You will love the smell of the pine scented mountain woods. Fresh mountain air does wonders for the mind, body, and soul and has been proven to help reduce stress levels. Dogs give the mountains of western North Carolina two paws up. With plenty of space to run, play, and swim, your pooch will be in dog heaven. Many of the surrounding mountain towns are dog-friendly featuring local restaurants and shops that welcome dog patrons. There is nothing like southern hospitality, and the North Carolina mountain community is no different. You will find that your neighbors are close, but not too close. This allows for the best of both worlds! The Grandview Peaks Community members can also enjoy various community events at our covered pavilion, complete with a large stone fireplace. If the mountain life is right for you, be sure to check out the lots available at Grandview Peaks. You will fall in love with the privacy of NC Mountain living combined with easy access to nearby amenities.